International medical work is a passion of mine and one that I hope to continue pursuing throughout my career. As I write this blog post, I’m flying to Peru to volunteer at a traveling medical clinic. In preparation for my trip, I’m reading a book called When Helping Hurts, by Steve Corbett and Brian Fikkert. This insightful book addresses the challenges and pitfalls of relief and development work in low-income countries. The book is not specifically tailored toward a medical audience, and the lessons it offers are applicable to any global humanitarian intervention. One of my favorite concepts presented by the authors is called the “participatory continuum.” This phrase describes the different relationships that can arise between local people and those seeking to provide charitable assistance. The authors posit that healthy relationships often involve “cooperation” and “co-learning,” where the local community and foreign relief teams form a mutually beneficial, collaborative liaison to drive positive change. This powerful and relevant concept reminded me greatly of my undergraduate thesis, in which I used interviews, field data and literature reviews to examine medical care delivery in the indigenous Mayan communities of rural Guatemala. I concluded that the following factors influence health care practice and utilization in every country, and should always be studied prior to beginning global health work. In the U.S., roles are clearly delineated for health care team members. Nurses and physician assistants have their own unique skills, and an attending physician leads the team. Primary care providers are gatekeepers, referring patients to specialists if necessary. Pharmacists, social workers and dieticians supplement care with their specific skill sets. In Guatemala, the roles are largely ambiguous. The folk sector consists of traditional healers, including those who employ purely spiritual means, and others who incorporate aspects of biomedicine. The professional sector includes formally trained practitioners such as doctors, nurses and pharmacists. Many patients see an array of these providers and combine their advice to create their treatment plans. To enter this system and practice medicine without first understanding and adapting to the existing structure would be detrimental for both patients and providers. Racism, homophobia, sexism and socioeconomic disparities are American social problems rooted in history and still permeate multiple systems, including health care. Every culture has firmly established social nuances that inherently influence health care delivery. A civil war in the late 20th century devastated many highland Mayan communities of Guatemala, killing many and forcing survivors to leave their homelands. The loss of Mayan culture and feelings of betrayal were channeled into a massive Mayan effort to restore ancient culture and tradition. This movement has restrengthened Mayan healers’ authority. Therefore, to dismiss the local village’s “curandera” and replace her holistic healing methods would not only be rude and disrespectful, but would also make a larger social statement about Mayan social politics. Economics play a significant role in American health care. The system is overburdened, and even when a patient has health care coverage, the emergency room copay is still a deterrent to seeking necessary care. Similarly, financial disparities pose a major problem to Guatemala’s medical system. The traditional sector, with its more flexible barter payment system, is vital in providing access to care. Therefore, maintaining traditional medicine alongside biomedicine helps overcome the system’s economic hindrances. Further, to dismiss the economic context and assume medicine operates in a moneyless world would be as ignorant and unproductive in the mountains of Guatemala as in Baltimore. 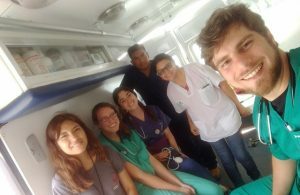 Our medical volunteering team inside the mobile clinic during my recent trip to Peru. The U.S. education system strives to keep its curricula relevant to adequately prepare students to care for their future patients in a changing world. For instance, while basic gynecologic knowledge has always been taught, many medical schools recently added material in their curricula about proper screening measures for transgender adolescents. Similarly, Guatemalan medical schools integrate important cultural topics into training. Medical students learn about traditional healing principles and techniques commonly used in indigenous populations. While recognizing the “evil eye” as a cause of the flu might not be endorsed as proper diagnostics, Guatemalan doctors must be able to understand a patient who brings her child to the clinic saying that he is plagued by the evil eye. The bottom line: providers educated in Guatemala know more about their patients than we do, and can connect with them at a more meaningful level. It is important to recognize this and learn from them rather than adopting a superiority complex and refusing help. While the importance of spirituality and the specific religious beliefs of each person vary, chaplains are an integral source of therapeutic support in most American hospitals. Various gifts and prayers can be found at the base of the large Jesus statue that welcomes people entering The Johns Hopkins Hospital. In addition, many hospitals, such as Georgetown University, have religious affiliations that influence the principles underlying medical practice. For Mayans, spiritual health is as vital as physical health, and the two are integral and interdependent. Well-trained Guatemalan practitioners recognize this and adopt this multidimensional approach to treatment as well. Additionally, recent conflicts between traditionalists, Catholics and Protestants challenge the authority of Mayan practitioners and present an extra factor determining health care access and utilization, as hospitals of certain denominations will not help patients from other religions. Clearly, a fundamental understanding of these concepts is important in helping Americans undertake the most helpful health interventions possible. In conclusion, it is imperative to study these five factors to determine the best means of helping people from cultures different than your own. Exploring these topics inherently requires cooperation and co-learning, which Corbett and Fikkert so adeptly point out in their book. This material is also relevant in a local context when helping people who live right down the street. I believe that if people embrace this holistic approach to medicine and public health, it can help make our work — both in the United States and abroad —more productive and sustainable. 2 Comments on "From Baltimore to Guatemala: Experiences in Global Health"